Mixing Bitcoins isn’t quite common yet even though it’s the most effective, cheapest and simplest way of making your Bitcoin transactions truly anonymous. With the hundreds of mixers out there it may be hard trying to find a mixer you can trust, that’s what this Blender.io review is all about. 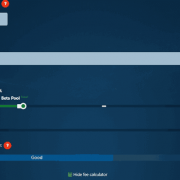 Throughout this Blender.io review we would bring forth all the important details which factor in when choosing a Bitcoin mixer to go with, such as the minimum/maximum limits, fee, logs policy, time-required, Registration process and anonymity. Before getting on with this Blender.io review, it’s important we understand how a Bitcoin mixer functions, that’s what the next section is dedicated to. 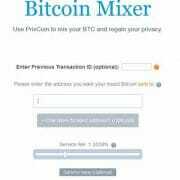 How does a Bitcoin Mixer Functions? “Making Bitcoin Anonymous” sounds like a pretty rocket-science thing, it isn’t. It basically is a input-output scenario. Users simply send their Bitcoins to the Bitcoin mixing platform, the platform keeps the users’ Bitcoins and sends them a new set of coins from their own reserve. Because the new set of coins received have no links to the previous coins the users sent in, they are pretty clean and can be used without in any way being linked to the older set of coins initially owned by the user. I’ve also answered some more questions related to Bitcoin mixers at the very end of this Blender.io review which you may go through should you feel like it. Time Delays: Yes, User controlled. How Easy or Hard is it using the Blender.io? Not everyone who uses Bitcoin is a tech-whizz, well you don’t need to be, not atleast when using Blender.io. Using the platform is pretty simple, straight-forward and self-explanatory. As is evident, anyone with basic English understanding and the knowledge of making a Bitcoin transaction can easily understand the steps to mix the coins, fret not I’ll still explain the elements on the screen. The first box is where you insert your output Bitcoin address, the address where you wish to receive the cleaned coins. 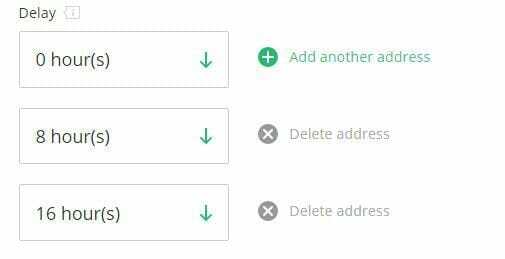 You can also click on the “Add Address” link at extreme side to add more than one addresses for your coins to be sent to. Then there’s the Delay drop-down menu, it let’s you specify how long you wish the platform to wait before sending out your cleaned coins. 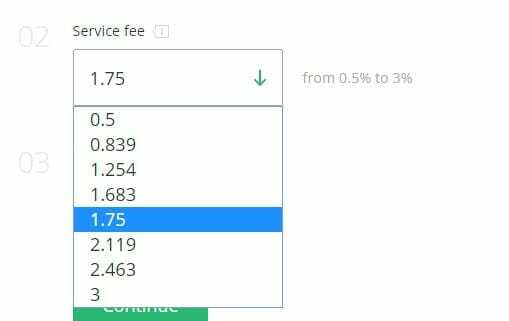 The “service fee” is the drop-down menu which let’s you choose the amount of service fee you’d like to pay the platform for mixing your Bitcoins. And finally, there’s the mixing code (optional) which we’ve explained in a later section of this Blender.io review. Once you click “continue” after filling in the above details, a deposit address is presented which is where the user needs to send his/her unclean coins to be cleaned. In a nutshell, even without going through the above explanation I bet each one of you reading this mixer review understood just fine how to mix your coins on Blender.io, didn’t you? As explained above, the platform lets you enter more than one output address, well as many as 10 of them in total! 10 is arguably the maximum number of address almost any other established Bitcoin mixer in the industry offers. When more than one addresses are used, you get the cleaned coins in all those different addresses rather than getting them in one single address, this takes your anonymity to a completely different level. That’s so because whatever input you sent in, isn’t the exact same amount any of those addresses receive and hence there’s no way anyone would ever link the output to your older coins, and even if they do know you sent coins to a mixer, there’s no way for anyone to figure out the exact addresses your coins were sent to. How much is the mixing fee? How much do you need to pay the platform in order for them to mix your coins? Well, not a lot! 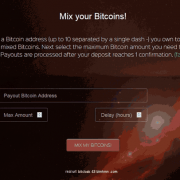 Blender.io is one of the few Bitcoin mixers in the industry which let you set your own mixing fee. The minimum fee however is 0.5% of the transaction which is pretty cheap and is at par with what other mixers in the industry are charging to mix your coins. Users have the choice of taking it up to 0.8, 1.25, 2.0 and so on to a maximum limit of 3%. The more this fee is, the faster your transactions are processed, and randomizing them makes your transactions harder to link back to the coins you sent in. The fee per transaction too is visible on the Blockchain. Hence if you use the standard 0.5% fee every time, it does make things easy for those prying on you, while randomizing the fee is like wrapping the transaction in different packets everytime making it harder to link new coins to older ones. Even though not an exclusive feature, it still is pretty-advanced and lets users prevent their own coins sent in different transactions from being mixed with each other. The mixing code is provided when you first mix your coins and can be entered on the subsequent transactions to let the platform know of your previous transactions. How long can outputs be delayed for on Blender.io? Contrary to almost everything on this planet, delayed outputs are actually “desired” when it comes to anonymizing your Bitcoins. That’s so because when you send your coins to a Bitcoin mixing platform, the time is recorded on the Blockchain. If the output is instant, it may (in very rare cases) lead to your newer set of coins if someone really digs deep enough. But when time-delays are used, your coins are sent out to you not instantly after they’re received, but rather after the delay period preset by you has passed. Blender.io needs a minimum of 3 confirmations on your transaction before they’re considered valid by the platform and are sent for cleaning. As for the minimum amount, it’s 0.005 BTC/transaction, anything below this amount is considered donation and isn’t refunded nor cleaned. The deposit address too is valid only for 24 hours hence every transaction with the minimum deposit amount needs to be sent to the deposit address within the 24-hour time frame. A Bitcoin mixer is all about anonymity and privacy, hence any mixer which keeps “logs” is neither anonymous nor private. Blender.io doesn’t keep any logs whatsoever, it has a “Zero” retention period as per their F.A.Q and all data related to a transaction are deleted once the coins are sent out to the receiving addresses. Is it Illegal to use Blender.io? Not by any definition of law, at least not in countries where Bitcoin isn’t outright declared illegal. If your Bitcoins aren’t obtained via illegal means, such as acts of terrorism, stealing, selling narcotics etc. and are legally procured, in that case, Blender.io is completely and totally legal. Even if your Bitcoins are illegal, using Blender.io itself isn’t an illegal act. That’s all I had to pour out for this Blender.io review folks, well I’ve brought forward everything that will ever matter to you when using the platform which should be enough for you to make a decision, isn’t it? In my personal opinion, it’s one of the best Bitcoin mixers which I’m stating based on its fee, additional address support, time-delay, and especially logs policy. The one feature it does miss is custom fee for each address individually, which would’ve further enforced your anonymity, but it’s not a deal-breaker. So all I’d say is try Blender.io the next time you have to mix your coins and let me know your feedback on the same, for now drop your opinion on this Blender.io review in the comments. 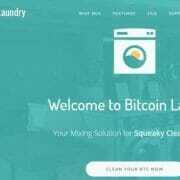 Bitcoin Laundry Review – Is It Legit or Scam? Bestmixer.io Review – Is It Scam or Legit? Bitcoin Fog Review – Is It Legit or Scam? Best Bitcoin Tumblers Services Copyright © 2019.